When you click an Auction Alerts button, you’ll be taken to a page where you can subscribe to the Auction Alert—choose from Wednesdays, Fridays, or both—and see a preview of the actual Auction Alert you’ll receive. 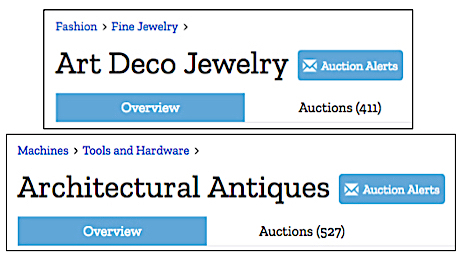 Auction Alerts are automated reminders of the top item listings in a particular CW category, filtered by Most Watched, Highest Bids, and Ending Soon. You can also subscribe to Auction Alerts in the Email Settings section of your Profile page. In the Profile page shown below, this user is subscribed to four Auctions Alerts, two of which they have elected to receive twice a week. You’ll notice that this user has also elected to subscribe to CW Post, which is a weekly newsletter featuring links to articles written by our staff writers. To subscribe to CW Post, just click the box next to the words “CW Post” in the Email Settings section of your Profile page. All of our email newsletters are free, and you can unsubscribe to any of them at any time. To unsubscribe from an Auction Alert or CW Post, simply click the “Manage my subscription” link at the bottom of the newsletter. 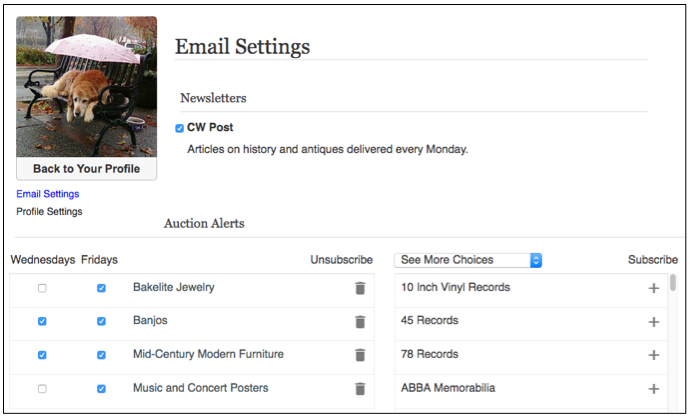 Please note that when you first sign up for either an Auction Alert or CW Post, we’ll send you an automated email with a link in it that you’ll need to click in order to confirm your email address. If you don’t receive this email within a few minutes, check your Spam or Junk mail folder. If you find this email in your Spam folder, be sure to mark it as “Not Spam” so future emails from us will go through. Gmail users can keep our emails out of their Spam folder by hovering over the words Collectors Weekly in the address line until a box appears that let’s you add our email address to your Contact list (see image below). Non-Gmail users can do the same thing—click here to learn how. Why am I not getting my emails?